English Origins Henry Pinder and Mary Rogers Pinder, early immigrants to Ipswich, Massachusetts in the Bay Colony, married on 22 May 1614 at St. Mary's the Great, in Cambridge, Cambridgeshire, England. Based on her stated age when immigrating Mary was born in 1582. This date might be wrong, it would make her in her thirties for her first marriage. Henry is believed to have been born by 1589, based on his date of marriage. Together they had seven children, six girls and one son, all born in England. 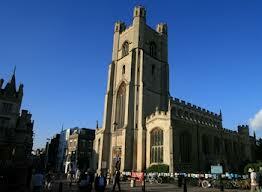 Baptismal records have been found for some of the children in Cambridge, England. Mary's parents are given to be George and Susan Locket. They were married in 1592. This was a full ten years after the birth of Mary. I think that pretty much rules them out. So unless someone comes up with some concrete evidence of the parentage of Henry and Mary, those spots will be blank in my tree! Coming to America There is no record of Henry coming to America, but his family was listed as passengers on the "Susan and Ellen" which sailed in May 1635 for Massachusetts. Mary age 53, Frances age 20, Mary age 17, Joanna age 14, Anna age 12, katherine age 10 and finally son John age 8. It is possible that Henry had previously traveled to Massachusetts and his family were joining him there. Life in Ipswich The first recorded mention of Henry is not until 1636, by that time he and his family had settled in Ipswich. He worked as a carpenter, but probably had to do some farming as well. He is recorded as owing the estate of one John Dillingham 6 pounds 12shillings. He and Thomas Rowell, another ancestor, had contracted to build a prison house, which they did not complete and were sued in 1653. Henry was mentioned in only one land record. Although he spent 20 years in Ipswich, he managed to remain mostly under the radar. 1. Frances baptized at St. Mary the Great, Cambridge, England on August 6, 1615; no further record found after her emigration. 2. Mary was baptized at St. Mary the Great, Cambridge on September 14, 1617; died at Gloucester, Massachusetts on January 9, 1648, the date of her daughter Marie was born; married Solomon Martin at Gloucester on March 21, 1643. 3. Joanna born about 1620; died in October, 1690; married first Valentine Rowell at Salisbury on November 14,1643; married second William Sargent at Amesbury on September 18, 1670 as his second wife; married third Richard Currier at Amesbury on October 26, 1676. my ancestor. 4. Anna was baptized at St. Andrew the Great at Cambridge on January 13, 1621/2; no further record after sailing to New England in 1635. 5. Katherine Pinder was baptized at St. Andrew the Great, Cambridge on January 23, 1624/5 and sailed for New England in 1635; no further record. 6. John Pinder was born about 1627; married by 1658, married Elizabeth Wilson, daughter of Theophilus Wilson, of Ipswich. 7. Phebe Pinder, baptized 1629. No further record, did not sail to America. "England Marriages, 1538–1973," database, FamilySearch (https://familysearch.org/ark:/61903/1:1:NNDK-V5N : 10 February 2018), Henrye Pinder and Mary Rodgers, 22 May 1614; citing Cambridge, Cambridge, England, reference , index based upon data collected by the Genealogical Society of Utah, Salt Lake City; FHL microfilm 1,818,407. "England Marriages, 1538–1973," database, FamilySearch (https://familysearch.org/ark:/61903/1:1:NJPH-18S : 10 February 2018), Michael Pinder and Mary Aldworth, 27 Jun 1633; citing Saint John,Hackney,London,England, reference , index based upon data collected by the Genealogical Society of Utah, Salt Lake City; FHL microfilm 569,925. "England Births and Christenings, 1538-1975," database, FamilySearch (https://familysearch.org/ark:/61903/1:1:NPLQ-MMS : 11 February 2018, Michaell Pindar in entry for Henry Pindar, 20 Nov 1636); citing , index based upon data collected by the Genealogical Society of Utah, Salt Lake City; FHL microfilm 845,247.